The new MBC TV Wednesday and Thursday drama, The King 2 Hearts will meet the audience on March 21st, 2012. 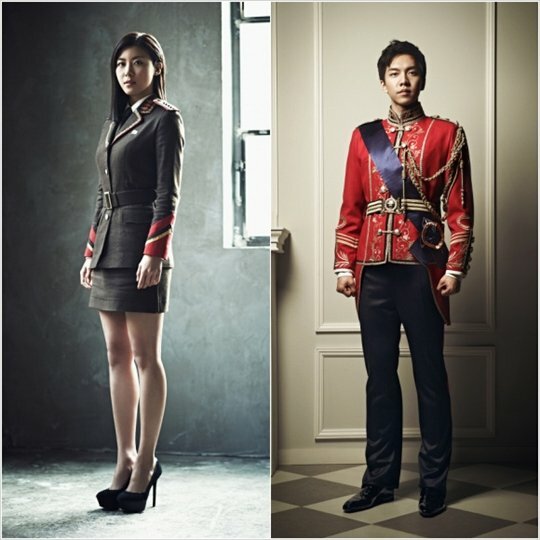 The new characters setting, plot and the starring by Ha Ji Won and Lee Seung Gi raised the expectation towards the new drama. King 2 Hearts tells the black humor story of South Korea with the system of constitutional monarchy, the South Korea Prince Lee Jae Ha and North Korean Special Forces instructor Kim Yang Ah from knowing each other to falling in love to each other. – The reproduction of brilliant of Beethoven Virus: Gorgeous return of director Lee Jae Kyu and screenwriter Hong Jin Ah. King 2 Hearts is another drama by director Lee Jae Kyu and screenwriter Hong Jin Ah of popular drama Beethoven Virus. The TV series which was directed by Lee Jae Kyu such as Damo (2003) and Fashion 70s (2005) were well received. The TV series produced by Hong Ji Ah such as Over the Rainbow (2006) also received recognition of audience because of gorgeous lines and compact plot. Whether King 2 Hearts produced by them can lead the TV series broadcast at the same time slot is getting public attention. What’s most attractive about King 2 Hearts is the co-starring of Ha Ji Won and Lee Seung Gi. The dramas starred by Ha Ji Won such as Damo, Something Happened in Bali, Hwang Jini, Secret Garden and others all achieved high ratings, showing the power of popular skillful actress. And Lee Seung Gi not only has the title of ‘national brother,’ he also successfully stands firmly in the TV series industry by virtue of drama Brilliant Legacy and My Girlfriend is a Nine-Tailed Fox, becoming highly anticipated new idol. How could one not looking forward to what chemistry reaction that will result from collision of two superstars? The casting of 3 competent actors to join the show also added a lot of bright spots to the series. Because of character of the role played by Yoon Je Moon has stand out personality, he is given the title of “insane existence’ by the audience. He will play the villain who challenges the royal family, highlighting his own unique “evil temperament.” Lee Yoon Ji plays the role of princess who pays attention to non-mainstream culture. While musical star Jo Jung Suk plays the role of squadron commander for royal guard who conscientiously serves the royal family. Let’s look forward to what’s the bright spot that will be brought by cooperation of 3 persons. Because of the joining of Lee Soon Jae, Yoon Yeo Jung and Lee Sung Min, The King 2 Hearts is more promising. Lee Soon Jae plays the role of Eun Kyu Tae, chief secretary who has served royal family for over 20 years continously. Yoon Yeo Jung plays the role of great princess Bang Young Sun, while Lee Sung Min plays the role of Lee Jae Gang, the 3rd generation king of Korea who is well loved by citizens. The three persons will bring to audience the distinct personality for the image of characters. In addition to the above, King 2 Hearts also has one major highlight, that’s the setting of constitutional monarchy as the background for the story, and involves the sensitive topic of South and North Korea. Republic of Korea royal family allows audience to peep inside the royal family of great princess, king, prince and princess, how could audience not curious? And drama also breaks away from the reality of confrontation between two countries, staging the romance of South man North woman. The ‘love in confrontation’ is definitely pocketing the public’s attention. The King 2 Hearts looks like a romantic comedy drama series, but after deeper understanding, you will discover that it actually rich in humanity, romance, love, revenge, suspense, black humor and other elements. In the drama, there are two persons who completely differ in both value and growth environment, the sweet content of how they overcome difficulties to walk to happiness, the cliffhanging plot of revenge and secret, and also hilarious plot and black humor implanted with social message.